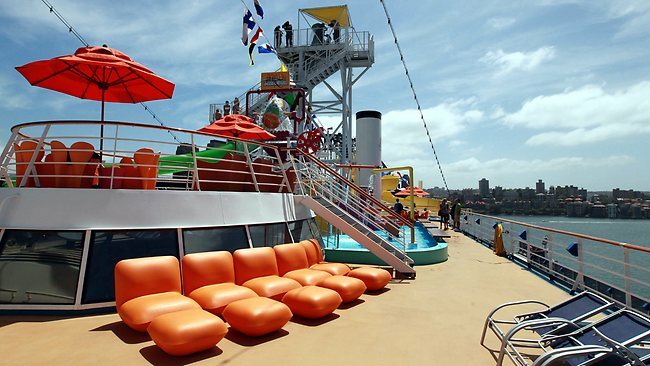 WITH VB and Tooheys New on tap, barbecue snags served on the deck and baristas trained by Australia's best, passengers aboard the Carnival Spirit will barely know they're on an American ship. The newest and largest ship to be home ported in Australia arrived in Sydney for the first time yesterday after a $7 million upgrade to prepare it for its new market. It will be the first time in the 40-year history of Carnival Cruise Lines that the company has home-ported a ship outside the US year-round - a sign of the growing importance of cruising Down Under. The 2,680-guest ship has had US power points ripped out and replaced, 14 Australian beers and four ciders added and pokie machines changed. Workers will spend the rest of the week finalising construction of Fat Jimmy's barbecue restaurant before the first official cruise to New Caledonia on Saturday. Sydney-based Australian barista of the year Shoji Sasa was also on board yesterday to train the ship's baristas how to make quality coffee the way Aussies like it. "We wanted to make it more homey for our Australian guests,'' senior vice-president of guest operations Mark Tamis said. "What's more Australian than having a barbecue experience outdoors? Carnival Spirit is also known for having the steepest and fastest water slide at sea, the Green Thunder, which was also added with the Australian market in mind. Michael Saros, 22, from Manly, tested out the ship yesterday and was impressed with the ship's "Aussification''. "I think it's a great idea,'' he said. "Australia's got good beer and good coffee, so we have high standards. Craig Jost, 27, from Potts Point, agreed. "It's a bit of a home away from home,'' he said. Carnival Cruise Lines Australia & New Zealand director Jennifer Vandekreeke said the company originally came to Australia because it felt the company would be a great fit with the Aussie personality, being playful, outgoing and fun-loving. A record half a million cruise lovers are set to travel on ships in Australian waters over the summer season, with experts attributing its popularity to the great value of cruise holidays, more and bigger ships coming to Australia, convenience and accessibility.